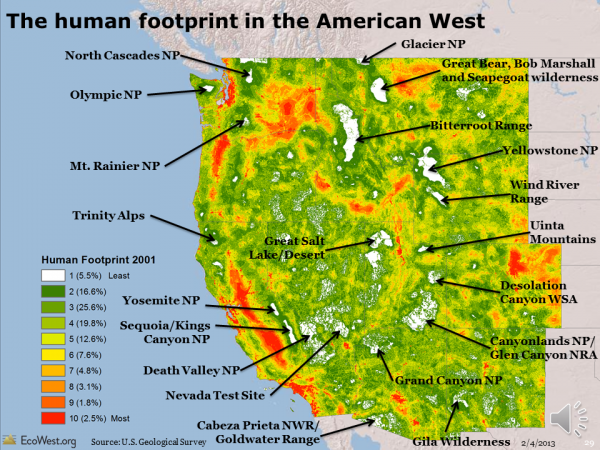 Just a quick post to let you know that I’ve created a gallery of high-resolution maps depicting the human footprint in each of the 11 Western states, plus some major cities in the region. I wrote about this dataset a few weeks ago and wanted to share some more detailed, zoomed-in views. 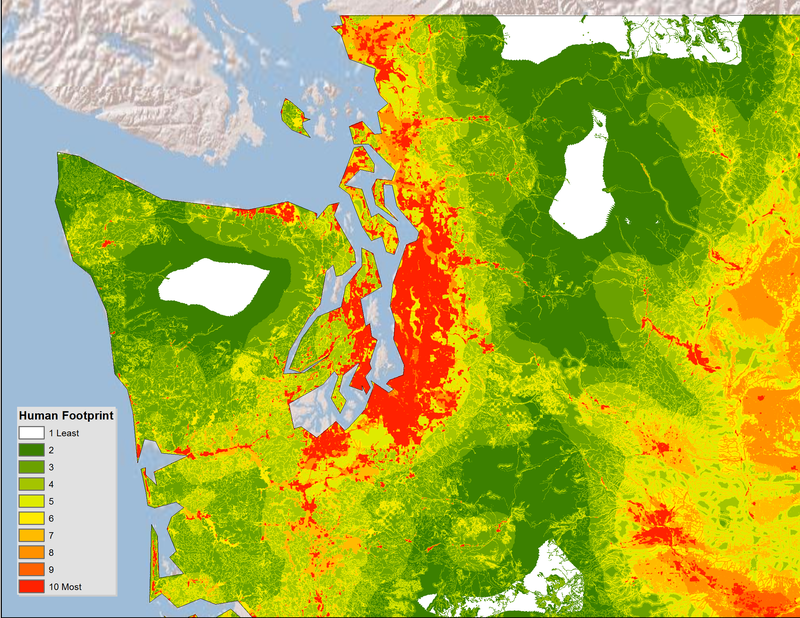 White indicates areas with the least human impact, followed by green for places where the footprint is minimal, while orange and red areas are where people have done the most to transform native ecosystems. Below is the gallery, which also available on this page. 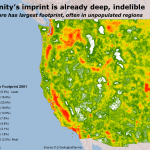 The human footprint map is based on the work of U.S. Geological Survey (USGS) scientists and was the basis of a 2008 paper in Ecological Applications by Matthias Leu, Steven E. Hanser, and Steven T. Knick. 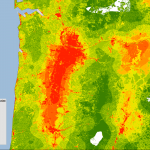 The scientists focused on 14 features, including the location of cities, farms, roads, canals, power lines, oil and gas wells, and human-caused wildfires. Please let me know if you have any issues viewing the maps. This is the first time I’ve used the WordPress gallery feature and I’m wondering if it’s an effective tool for sharing images. 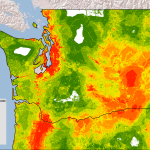 Same goes for anything on EcoWest: as we get off the ground, we’re looking for feedback, suggestions, and other comments from users so we can make this site as useful as possible. Thanks! Lay of the land: who owns the West? The preponderance of public land is one of the American West’s defining features and it’s a primary reason why so much of the region has escaped the kind of intensive development that characterizes most areas back East. In this set of slides, I examine the lay of the land in the West and explain how the mosaic of ownership has shaped the region’s evolution. Although the federal government is the biggest player in the region, the future of the West’s environment also hinges on state, tribal, and private land-management decisions. Land ownership in the American West from EcoWest on Vimeo. 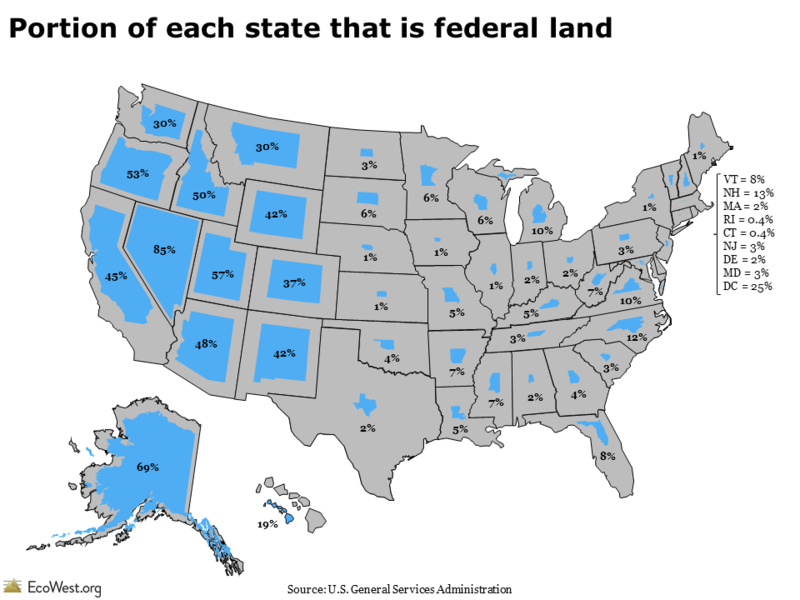 The U.S. government owns nearly half of the 11 Western states, but those federal acres are managed very differently by a host of agencies with varying mandates. 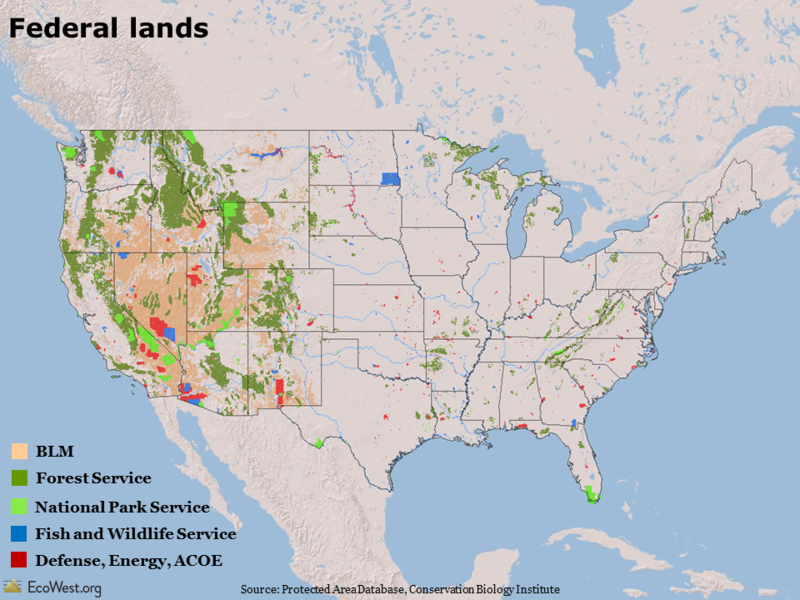 Wilderness areas within national parks or wildlife refuges ban nearly all human development, while some Forest Service and Bureau of Land Management properties are more like industrial zones, with priority given to intensive logging, mining, drilling, grazing, and motorized recreation. The graphic below, based on a similar map in a 2008 Stanford magazine article, shows what share of each state is federal land. In some parts of the West, such as the Great Basin in Nevada, it seems like the federal government owns everything in sight. But these slides show that the level of federal influence varies dramatically across the region. 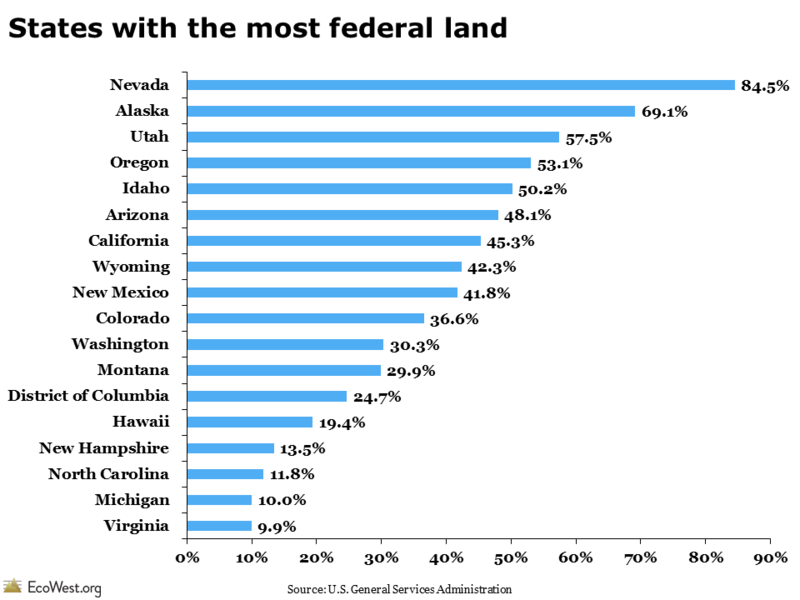 At the low end, about 30 percent of Montana and Washington land is federally owned; at the top, Nevada is nearly 85 percent federal. There’s also considerable variability within individual states: the plains of eastern Colorado, for example, are nearly all private, while the Rocky Mountains in the center of the state are predominantly federal. In an incredibly diverse region, it’s hard to envision a “typical” Western landscape, but there’s a general pattern in ownership. Pioneers tended to settle around streams and rivers, so many of the West’s vital watercourses are surrounded by private land (such lands often harbor the greatest biodiversity). 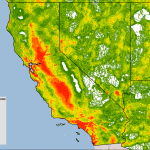 Mountain ranges are often under the purview of the Forest Service, with wilderness areas sometimes found at the highest elevations (where biodiversity and biological productivity tends to be lowest). In the basins between these ranges, the Bureau of Land Management tends to dominate the drier, lower-elevation areas. There are other key players. Tribal land, which covers large portions of Arizona and New Mexico, is found in every Western state. Military training and weapons experiments take place on lands controlled by the departments of Defense and Energy. Some of these places, such as the fabled Area 51 in Southern Nevada, are top secret, but portions of others, such as the Barry M. Goldwater bombing range in Southwest Arizona, are open to recreational users who get a special permit. Especially in the West, but also in some parts of the upper Midwest and Northeast, state governments control a fair amount of land. Out West, these acres were generally given to the states by the federal government when territories entered the union. Typically, states are supposed to raise money for their public schools by selling some of these lands to the highest bidder, so protections for these areas are far from permanent. Because there’s so much public property in the West, many landscapes are at least nominally protected by the government. But public ownership doesn’t equal immunity from human influence. As I discuss in another post, the vast network of roads and other infrastructure in the region has fragmented habitat and abetted the spread of non-native species. The multiple-use philosophy that governs much of the property overseen by the Forest Service and Bureau of Land Management means natural resources may be vulnerable to development and human activity. What patterns in land ownership do you notice in these slides? 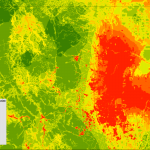 The maps of land ownership come from the Protected Area Database. 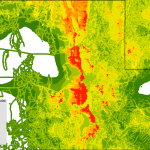 This data from the Conservation Biology Institute is available for free download on DataBasin. 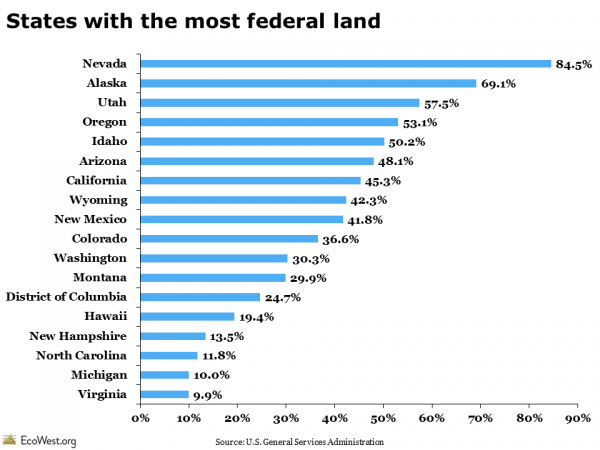 Other valuable sources of data on land ownership include the Bureau of Land Management’s Public Land Statistics report, the U.S. Department of Agriculture’s Economic Research Service, and the U.S. General Services Administration’s Federal Real Property Profile (the latest report is from 2004, but these figures haven’t changed much in recent years). Over the past few years, I’ve been creating slides—hundreds and hundreds them. The David and Lucile Packard Foundation, a major environmental funder, asked us to take stock of the state of the North American West, one of its geographic priorities. Rather than write a report that would quickly be shelved, we decided to answer the question in PowerPoint by developing a half-dozen presentations that summarize environmental trends (see our summary here). If I had to pick a “favorite” slide out of the more than 500 I created, it would be the one below, which illustrates the intensity of the human footprint in the region based on an analysis of urbanization, agriculture, transportation networks, energy development, and other factors. Despite the preponderance of public land in the region, few areas have been spared from direct—and oftentimes permanent—human influence. Even landscapes far from any city or suburb have been irreparably altered by farms, roads, gas wells, invasive species, and a host of other human-driven forces. 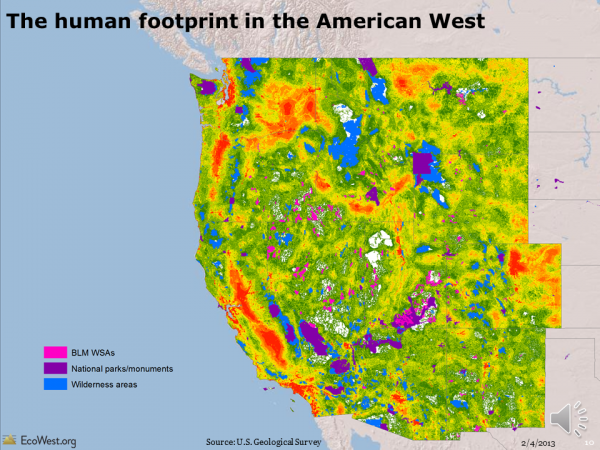 At the same time, this map shows that the West is still home to vast expanses of untrammeled land and some of the wildest terrain left on the continent. In light of climate change, we can no longer describe any place on Earth as pristine. But the blank spaces on this map still retain the natural qualities that have captivated visitors for centuries and they continue to support an amazing array of ecosystems. Mapping the human footprint in the American West from EcoWest on Vimeo. 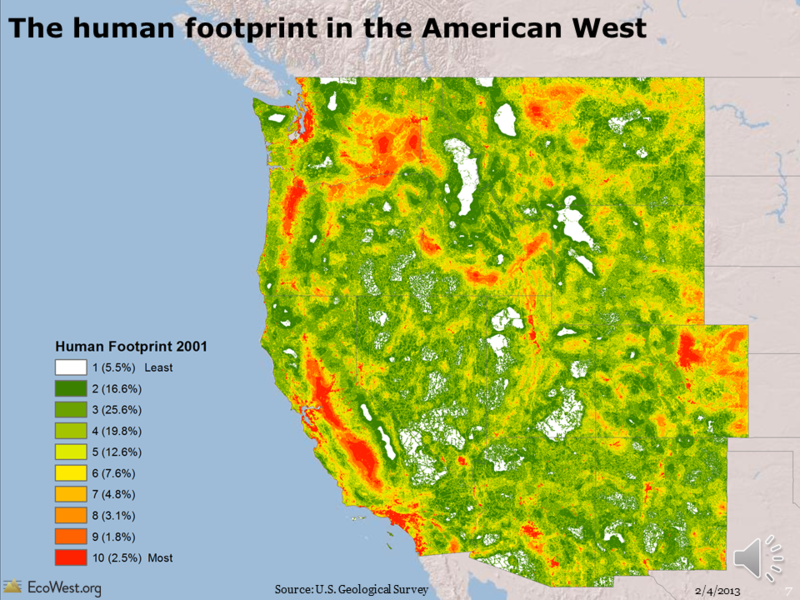 The human footprint map is based on the work of U.S. Geological Survey (USGS) scientists and was the basis of a 2008 paper in Ecological Applications by Matthias Leu, Steven E. Hanser, and Steven T. Knick. 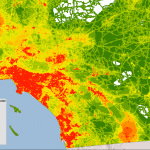 White indicates areas with the least human impact (5.5% of the region), followed by green for places where the footprint is minimal, while orange and red areas are where people have done the most to transform native ecosystems. 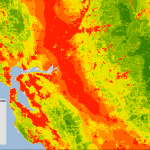 What’s really cool about this map is its detailed resolution: 180 meters, or 591 feet. I must confess that I’ve spent an inordinate amount of time zooming around this map and ground-truthing it against my travels in the region. If you love spending time in the wilderness, the white and deep green pixels offer a sort of bucket list for backcountry trips. I’ve annotated some in the map below. 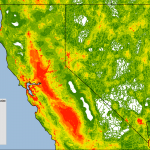 As you might image, many of the most heavily impacted areas are in and around cities, with the metropolises of Southern California, the Bay Area, Puget Sound, and the Colorado Front Range showing up clearly. But it turns out that agriculture has the biggest footprint in the region, sometimes in places without many people. 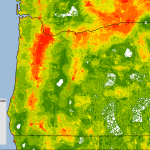 While the Central Valley of California and the Willamette Valley of Oregon are home to some good-sized cities, there aren’t many residents in the orange and red sections of Southeast Washington and Southern Idaho. Many of the white and deep green sections are already protected as wilderness areas, usually in national forests or national parks, but sometimes on land managed by the Bureau of Land Management (BLM) and Fish and Wildlife Service. In this version below, blue indicates the location of wilderness areas in places such as the Sierra Nevada, Mojave Desert, Northern Cascades, and Northern Rockies. Purple shows where national parks and monuments are located. Larger parks, such as Yellowstone, Glacier, Death Valley, Yosemite, Grand Canyon, Canyonlands, and Olympic are clearly visible. Pink depicts so-called Wilderness Study Areas, which the BLM is currently managing as wilderness but which haven’t been permanently protected by Congress. These wilderness areas, parks, monuments, and Wilderness Study Areas cover many of the least disturbed areas, but not all of them. Most of the other areas that are white or deep green are public lands, but they are not receiving the special protections afforded to wilderness and preserves. Even land that is ostensibly “public,” such as the millions of acres of state-owned school-trust land in the West, may be vulnerable to development because state governments help fund their educational systems through the sale and lease of such parcels. Poring over these maps, I was surprised by the extent of farming’s footprint and impressed by the size of some undeveloped areas in the Northern Rockies and Southwestern deserts. 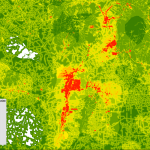 What geographic patterns strike you as most meaningful? Does the map match your own experiences in the West? 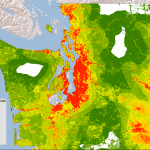 You can learn more about the analysis and download the data on this USGS website. The 2008 Ecological Applications paper is available here and the USGS offers a summary here.